This case was designed for the chapter on the respiratory system for Anatomy and Physiology. It is based on materials from the Berkeley website: Understanding Evolution. 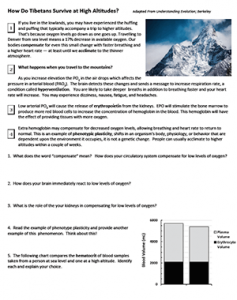 In this version, the focus is on the how the body maintain homeostasis at high altitudes. For most individuals, this involves increased production of red blood cells to improve oxygen supplies to tissues. Tibetan populations have actually adapted to high altitudes by producing fewer red blood cells. Students work though the case to discover why having too many RBC’s can be a disadvantage when it comes to reproduction. The lesson also includes a return to the idea of hematocrit, which students learned in earlier chapters on blood. Students will discover that blood becomes thicker at high altitudes and that increases the risk of miscarriage and low birth weight. Lowered production of RBC’s is traced to a change in the EPAS1 gene. Students compare the presence of this change found in Tibetans to their close relative the Han Chinese. A single nucleotide polymorphism can be used to track differences in the two populations. Overall, this lesson connects genetics, DNA, and evolution to topics in anatomy and physiology. Students will analyze data from primary sources showing birth weights and prenatal mortality. For more in-depth coverage of the topic, the research can be printed from the Journal of Applied Physiology. CCC 6. Structure and function. The way in which an object or living thing is shaped and its substructure determine many of its properties and functions. Hey, just saying that my teacher my biology teacher used your outline and so I’m wondering if you wanted people to do that? All of my materials are licensed as creative commons, anyone is welcome to use them. Plus, much of my content is built from other open source sites. I do not have one made, I’ll put that on my summer to-do list. I have all 53 of EPAS1 variants and 268 Neanderthal variants with no Denisovan and I am Scandinavian/Lombard of J-M67 Haplogroup. As a teenager I was able to achieve 100 meter under water swimming in several months of training and my blood solids were at 30%. I guess it is more complex than you think. That’s amazing that you have all that information about your genotype! Is is definitely complex!